About the vast diversity of the animal world. About the need for habitat preservation. Modern zoos work to save endangered species and promote the sustainable use of resources throughout the world. Although no zoo can duplicate an animal’s natural habitat, increasingly sophisticated habitat simulations result in better reproduction rates and more natural animal behaviors. As a place of fun and learning, zoos are especially good for infants and toddlers, who respond to the colors and sounds. Although preschoolers may be excited to meet animals that play a prominent role in their storybooks, zoological professionals discourage children from believing that real animals lead lives like those in Mother Goose. Instead, they emphasize a realistic approach. For older children, participating in zoo volunteer pro-grams may help them decide on a future career. 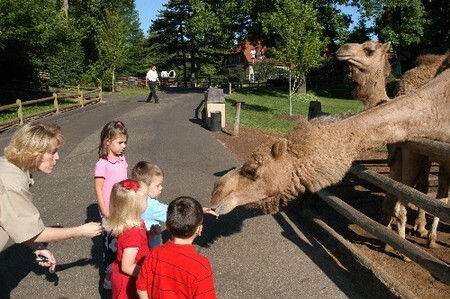 Zoo programs taught by professional educators can nourish the natural affinity all children have for animals. Furthermore, zoos provide an opportunity to see species that most of us will never see in the wild. San Diego Zoo, California. My parents first took me to the zoo when I was six months old. 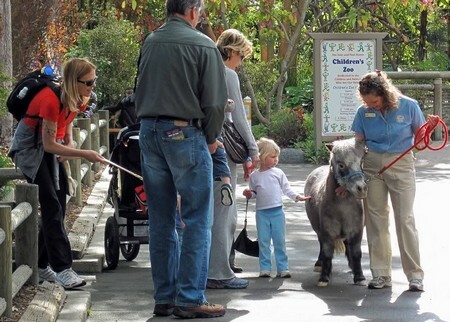 It wasn’t just any zoo, but the San Diego Zoo, which many regard as the world’s best. My sister and I have vivid memories of countless trips to this zoo. It all ended, however, when I was seven and our parents decided to move the family to the rural Midwest. In our minds, those Shetland ponies, Holstein cows and Leghorn chickens just couldn’t compete with the zoo’s bobcats, grizzlies, and pink flamingos. Even the landscaping had an air of excitement about it. Spread over one hundred acres of rugged canyons in downtown San Diego, the zoo’s zillions of plants (sixty-five hundred species) outnumber its four thousand animals (eight hundred species). Children’s Zoo, or watch pygmy chimps swing through the trees in one of the zoo’s bio-climates. We carry along a picnic lunch in our day packs. The zoo’s grounds are an official botanical garden, with plenty of shady benches. From its inception in 1916, the Zoological Society of San Diego has been a leader in natural zoo design. Since the beginning, many of its animals have lived in open, moated enclosures. In recent years, zoos across the country have moved beyond the “royal bestiary” concept of collecting two or three representatives of every species. Now they concentrate efforts on creating larger, more nearly natural habitats for fewer species. These are the new zoos. San Diego, for example, has opened several bio-climate zones during the last decade. These include Gorilla Tropics, Tiger River, Sun Bear Forest, and the Pygmy Chimps. San Diego has great parent-participation programs for preschool and elementary-age children, including overnight safari sleepovers. Other programs allow junior-high kids to come nose-to-nose with endangered species. Like many zoological parks, San Diego Zoo is open every day of the year and has reasonably priced family memberships. Information: (619) 234-3153. San Diego Wild Animal Park, California. Also worth a visit is the zoo’s sister attraction. San Diego Wild Animal Park is nearly twenty times larger than the zoo—big enough to simulate the African veldt—and is a thirty-mile drive north of San Diego. Animals, including several endangered species, roam freely over the large acreage. While at the park, visit the Butterfly Encounter. This exhibit annually buys tens of thousands of tropical butterfly cocoons from village farmers in Central America and Southeast Asia—thereby supporting the efforts of native people who make a living from the rainforest without chopping it down. Information: (619) 234-6541. The Florida Aquarium, Tampa, Florida. Opened in 1995, this is no ordinary fish tank. Visitors experience the peninsula state in a series of fascinating galleries: Florida Wetlands, Bays and Beaches, Coral Reefs, and Florida Offshore. You travel from the source of Florida’s water, its marvelous crystal springs, down streams and rivers, through saw grass marshes, past hammocks, cypress swamps, mangrove forests, through bays, past beaches, coral reefs, and out to the open ocean. Along the way you see loggerhead turtles, pickerel, gar, alligators, channel catfish, white ibis, bromiliads and orchids, roseate spoonbills, snook, mullet, queen conch, oysters, mussels, grouper, octopus, jellyfish, tiger shark, brown shark, and pompano. The reef habitat simulates a sixty-foot dive past living coral. Staghorn and elkhorn corals shelter schools of tiny fish in their branches, and the soft corals bend and sway in the tidal surge. There are more than 550 species of animals and plants at the aquarium, all of them native to Florida. This is truly a Florida aquarium, dedicated to environmental education by exhibiting the beauty and diversity of the state’s aquatic habitats. Children especially enjoy participating in the state-of-the-art, interactive wetlabs. Information: (813) 273-4000. Bronx Zoo, New York. One of five zoos, aquariums, and wildlife conservation parks in the New York City area administered by the New York Zoological Society. More than four thousand animals on 265 wooded acres. Day camp for kids during the New York school system’s winter vacation. Information: (718) 367-1010. St. Louis Zoo, Missouri. No general admission charge to view its nearly seven hundred species of animals.’ There are fees, of course, for special children’s programs, which include exploring ponds, visiting Indian mounds, and learning about wildlife in the Ozarks. Teens can earn community service hours, talk with animal experts, and meet other teens with an interest in the environment. Information: (314) 781-0900. Toledo Zoo Hippoquarium, Ohio. One of the few such facilities in the country. Visitors watch from underwater windows as a hippo family swims in its 360,000-gallon pool. Information: (419) 385-5721. Point Defiance Zoo and Aquarium, Tacoma, Washington. Kids love the polar bear and shark exhibits. Information: (206) 591-5335. Audubon Park and Zoological Garden, New Orleans, Louisiana. Southern swamp and bayou exhibit. Information: (504) 861-2537.